Many companies consider migrating from relational databases like MySQL to Amazon DynamoDB, a fully managed, fast, highly scalable, and flexible NoSQL database service. For example, DynamoDB can increase or decrease capacity based on traffic, in accordance with business needs. The total cost of servicing can be optimized more easily than for the typical media-based RDBMS. This post introduces two methods of seamlessly migrating data from MySQL to DynamoDB, minimizing downtime and converting the MySQL key design into one more suitable for NoSQL. AWS Database Migration Service (AWS DMS) can migrate your data to and from most widely used commercial and open-source databases. It supports homogeneous and heterogeneous migrations between different database platforms. Amazon EMR is a managed Hadoop framework that helps you process vast amounts of data quickly. Build EMR clusters easily with preconfigured software stacks that include Hive and other business software. Amazon Kinesis can continuously capture and retain a vast amount of data such as transaction, IT logs, or clickstreams for up to 7 days. AWS Lambda helps you run your code without provisioning or managing servers. Your code can be automatically triggered by other AWS services such Amazon Kinesis Streams. AWS DMS supports migration to a DynamoDB table as a target. You can use object mapping to restructure original data to the desired structure of the data in DynamoDB during migration. Consider this method when more complex conversion processes and flexibility are required. Fine-grained user control is needed for grouping MySQL records into fewer DynamoDB items, determining attribute names dynamically, adding business logic programmatically during migration, supporting more data types, or adding parallel control for one big table. After the initial load/bulk-puts are finished, and the most recent real-time data is caught up by the CDC (change data capture) process, you can change the application endpoint to DynamoDB. The method of capturing changed data in option 2 is covered in the AWS Database post Streaming Changes in a Database with Amazon Kinesis. All code in this post is available in the big-data-blog GitHub repo, including test codes. The following diagram shows the overall architecture of both options. This section discusses how to connect to MySQL, read the source data, and then format the data for consumption by the target DynamoDB database using DMS. Create a replication instance that has sufficient storage and processing power to perform the migration job, as mentioned in the AWS Database Migration Service Best Practices whitepaper. For example, if your migration involves a large number of tables, or if you intend to run multiple concurrent replication tasks, consider using one of the larger instances. The service consumes a fair amount of memory and CPU. As the MySQL user, connect to MySQL and retrieve data from the database with the privileges of SUPER, REPLICATION CLIENT. Enable the binary log and set the binlog_format parameter to ROW for CDC in the MySQL configuration. 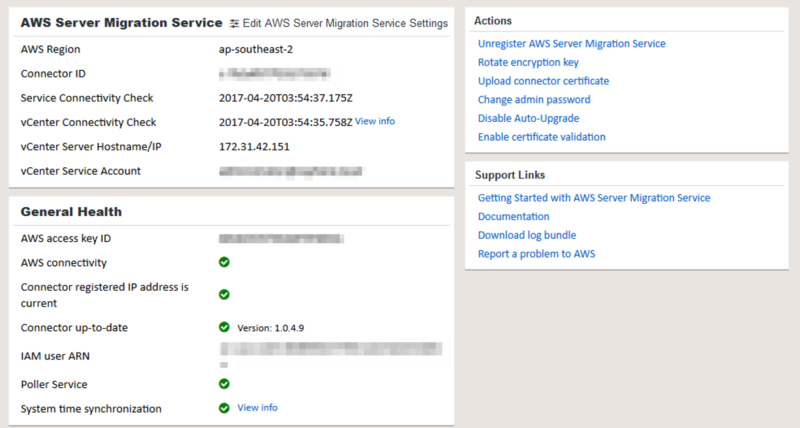 For more information about how to use DMS, see Getting Started in the AWS Database Migration Service User Guide. Before you begin to work with a DynamoDB database as a target for DMS, make sure that you create an IAM role for DMS to assume, and grant access to the DynamoDB target tables. Two endpoints must be created to connect the source and target. The following screenshot shows sample endpoints. The following screenshot shows the details for one of the endpoints, source-mysql. In this example, assume that the MySQL table has a composite primary key (customerid + orderid + productid). 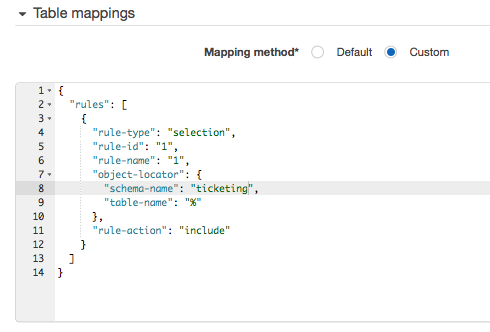 You are going to restructure the key to the desired structure of the data in DynamoDB, using an object mapping rule. In this case, the DynamoDB table has the hash key that is a combination of the customerid and orderid columns, and the sort key is the productid column. However, the partition key should be decided by the user in an actual migration, based on data ingestion and access pattern. You would usually use high-cardinality attributes. For more information about how to choose the right DynamoDB partition key, see the Choosing the Right DynamoDB Partition Key AWS Database blog post. DMS automatically creates a corresponding attribute on the target DynamoDB table for the quantity column from the source table because rule-action is set to map-record-to-record and the column is not listed in the exclude-columns attribute list. For more information about map-record-to-record and map-record-to-document, see Using an Amazon DynamoDB Database as a Target for AWS Database Migration Service. Migration starts immediately after the task is created, unless you clear the Start task on create option. I recommend enabling logging to make sure that you are informed about what is going on with the migration task in the background. The following screenshot shows the task creation page. 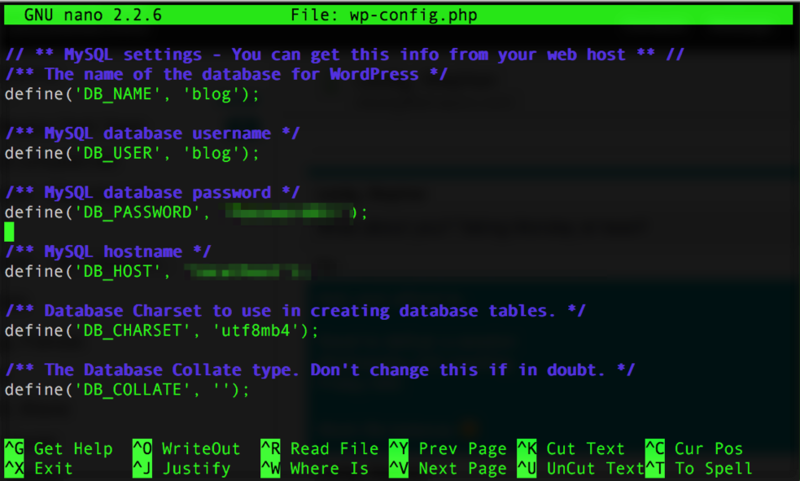 You can use the console to specify the individual database tables to migrate and the schema to use for the migration, including transformations. On the Guided tab, use the Where section to specify the schema, table, and action (include or exclude). 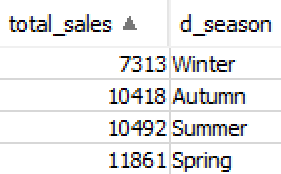 Use the Filter section to specify the column name in a table and the conditions to apply. Table mappings also can be created in JSON format. On the JSON tab, check Enable JSON editing. Here’s an example of an object mapping rule that determines where the source data is located in the target. If you copy the code, replace the values of the following attributes. For more examples, see Using an Amazon DynamoDB Database as a Target for AWS Database Migration Service. If the target table specified in the target-table-name property does not exist in DynamoDB, DMS creates the table according to data type conversion rules for source and target data types. There are many metrics to monitor the progress of migration. 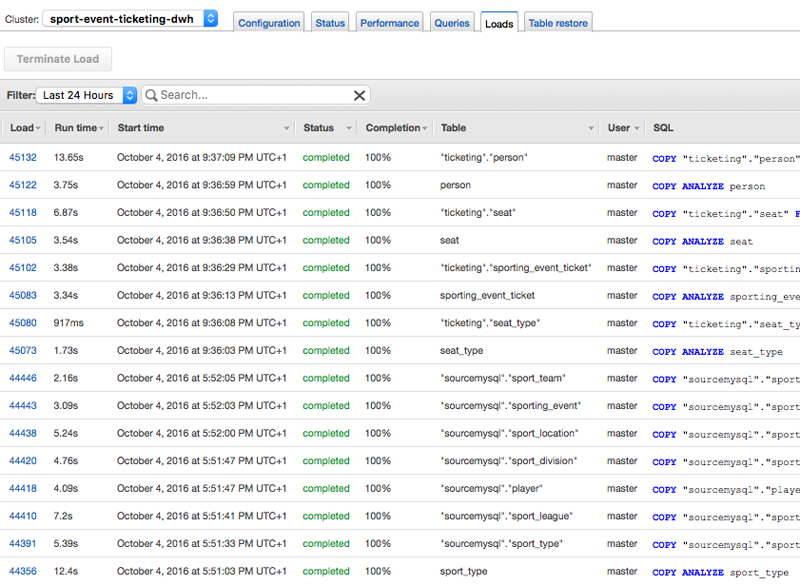 For more information, see Monitoring AWS Database Migration Service Tasks. The following screenshot shows example events and errors recorded by CloudWatch Logs. DMS replication instances that you used for the migration should be deleted once all migration processes are completed. Any CloudWatch logs data older than the retention period is automatically deleted. 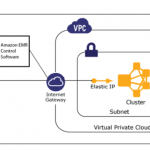 This section discusses an alternative option using EMR, Amazon Kinesis, and Lambda to provide more flexibility and precise control. If you have a MySQL replica in your environment, it would be better to dump data from the replica. When you decide to change your database from RDMBS to NoSQL, you need to find a more suitable key design for NoSQL, for performance as well as cost-effectiveness. Similar to option #1, assume that the MySQL source has a composite primary key (customerid + orderid + productid). However, for this option, group the MySQL records into fewer DynamoDB items by customerid (hash key) and orderid (sort key). Also, remove the last column (productid) of the composite key by converting the record values productid column in MySQL to the attribute name in DynamoDB, and setting the attribute value as quantity. This conversion method reduces the number of items. You can retrieve the same amount of information with fewer read capacity units, resulting in cost savings and better performance. For more information about how to calculate read/write capacity units, see Provisioned Throughput. Batch-puts: Export MySQL data, upload it to Amazon S3, and import into DynamoDB. Real-time puts: Capture changed data in MySQL, send the insert/update/delete transaction to Amazon Kinesis Streams, and trigger the Lambda function to put data into DynamoDB. Start real-time puts to Amazon Kinesis Streams. As soon as real-time puts commences, start batch-puts. After batch-puts finishes, trigger the Lambda function to execute put_item from Amazon Kinesis Streams to DynamoDB. Change the application endpoints from MySQL to DynamoDB. 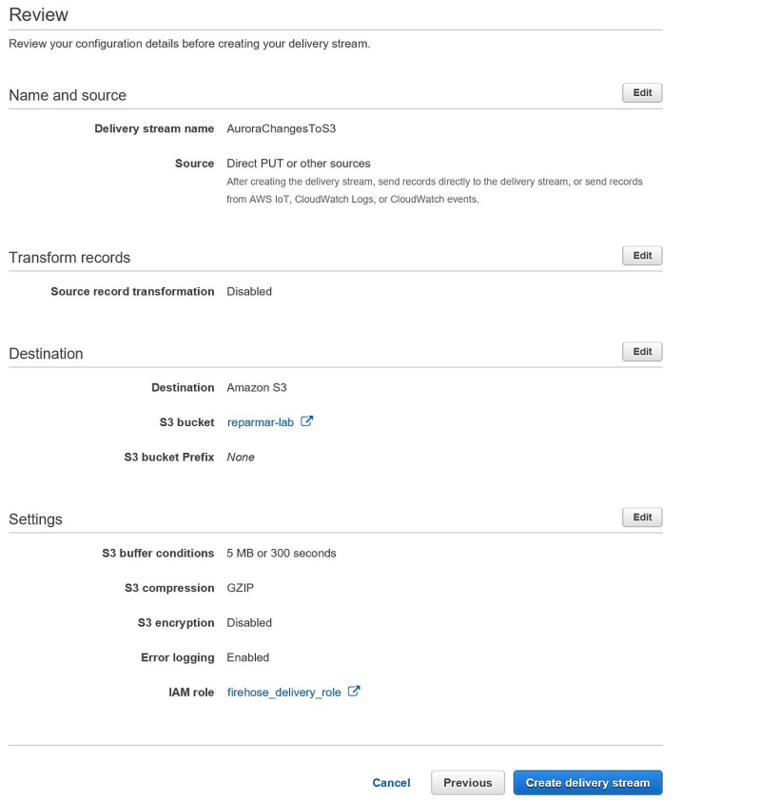 Firstly, create an Amazon Kinesis stream to retain transaction data from MySQL. Set the Data retention period value based on your estimate for the batch-puts migration process. For data integrity, the retention period should be enough to hold all transactions until batch-puts migration finishes. However you do not necessarily need to select the maximum retention period. It depends on the amount of data to migrate. In the MySQL configuration, set binlog_format to ROW to capture transactions by using the BinLogStreamReader module. The log_bin parameter must be set as well to enable the binlog. For more information, see the Streaming Changes in a Database with Amazon Kinesis AWS Database blog post. The following sample code is a Python example that captures transactions and sends them to Amazon Kinesis Streams. 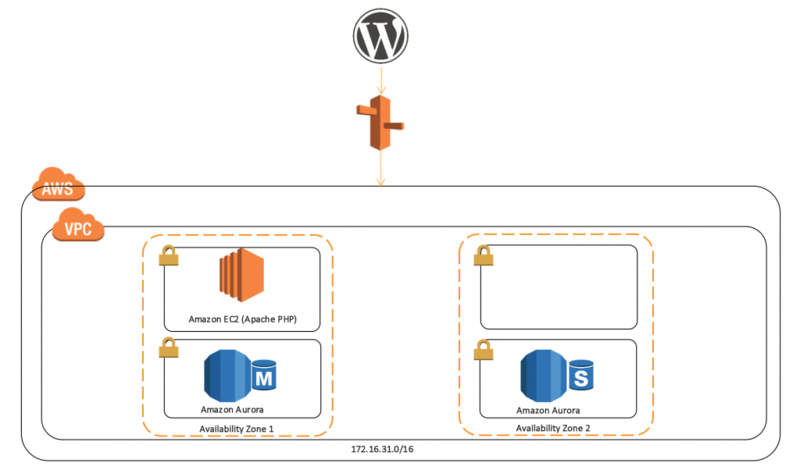 The easiest way is to use DMS, which recently added Amazon S3 as a migration target. For an S3 target, both full load and CDC data is written to CSV format. However, CDC is not a good fit as UPDATE and DELETE statements are not supported. 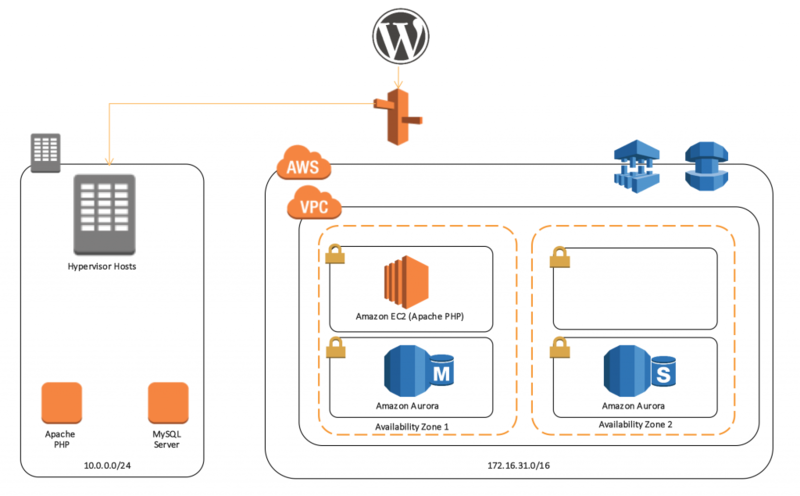 For more information, see Using Amazon S3 as a Target for AWS Database Migration Service. 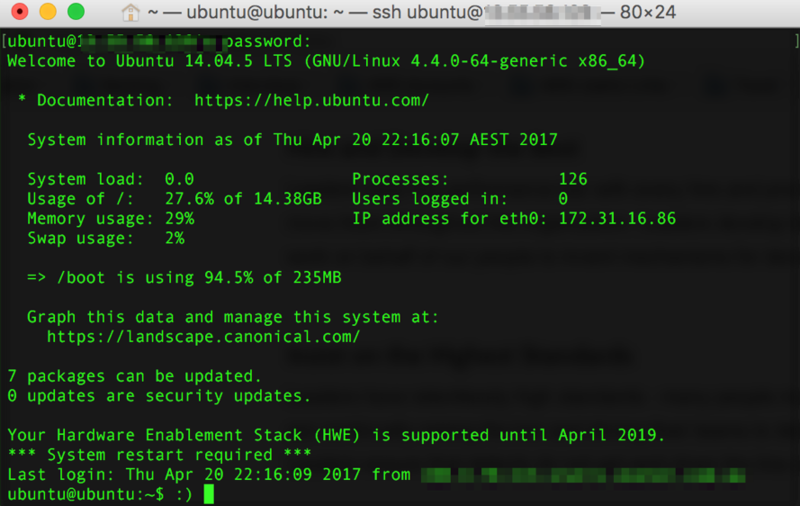 Another way to upload data to Amazon S3 is to use the INTO OUTFILE SQL clause and aws s3 sync CLI command in parallel with your own script. The degree of parallelism depends on your server capacity and local network bandwidth. You might find a third-party tool useful, such as pt-archiver (part of the Percona Toolkit see the appendix for details). I recommend the aws s3 sync command for this use case. This command works internally with the S3 multipart upload feature. Pattern matching can exclude or include particular files. In addition, if the sync process crashes in the middle of processing, you do not need to upload the same files again. The sync command compares the size and modified time of files between local and S3 versions, and synchronizes only local files whose size and modified time are different from those in S3. 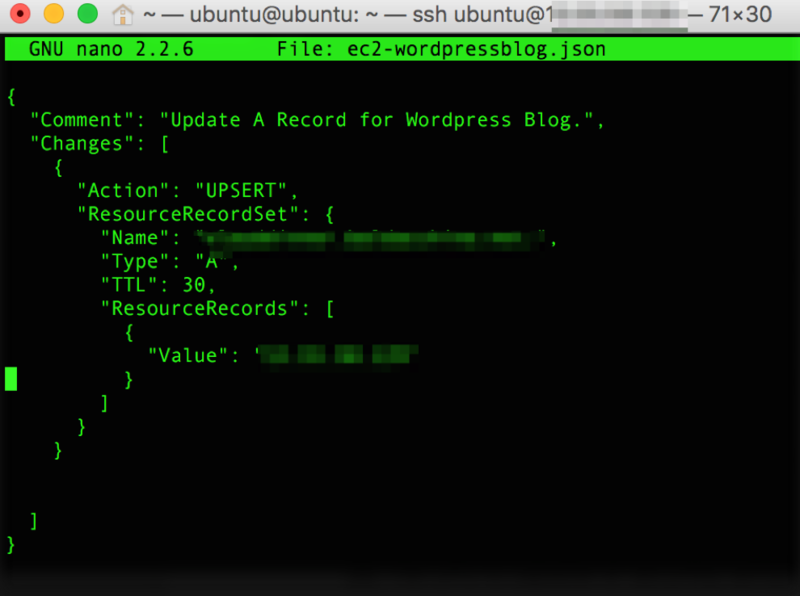 For more information, see the sync command in the S3 section of the AWS CLI Command Reference. Create a Hive external table against the data on S3 and insert it into another external table against the DynamoDB table, using the org.apache.hadoop.hive.dynamodb.DynamoDBStorageHandler property. To improve productivity and the scalability, consider using Brickhouse, which is a collection of UDFs for Hive. The following sample code assumes that the Hive table for DynamoDB is created with the products column, which is of type ARRAY<STRING >. The productid and quantity columns are aggregated, grouping by customerid and orderid, and inserted into the products column with the CollectUDAF columns provided by Brickhouse. Unfortunately, the MAP, LIST, BOOLEAN, and NULL data types are not supported by the DynamoDBStorageHandler class, so the ARRAY<STRING> data type has been chosen. The products column of ARRAY<STRING> data type in Hive is matched to the StringSet type attribute in DynamoDB. The sample code mostly shows how Brickhouse works, and only for those who want to aggregate multiple records into one StringSet type attribute in DynamoDB. A mapper task reads each record from the input data on S3, and maps input key-value pairs to intermediate key-value pairs. It divides source data from S3 into two parts (key part and value part) delimited by a TAB character (“\t”). Mapper data is sorted in order by their intermediate key (customerid and orderid) and sent to the reducer. Records are put into DynamoDB in the reducer step. Generally, the reduce task receives the output produced after map processing (which is key/list-of-values pairs) and then performs an operation on the list of values against each key. In this case, the reducer is written in Python and is based on STDIN/STDOUT/hadoop streaming. The enumeration data type is not available. The reducer receives data sorted and ordered by the intermediate key set in the mapper, customerid and orderid (cols,cols) in this case, and stores all attributes for the specific key in the item_data dictionary. The attributes in the item_data dictionary are put, or flushed, into DynamoDB every time a new intermediate key comes from sys.stdin. To run the MapReduce job, connect to the EMR master node and run a Hadoop streaming job. The hadoop-streaming.jar file location or name could be different, depending on your EMR version. Exception messages that occur while reducers run are stored at the directory assigned as the –output option. Hash key and range key values are also logged to identify which data causes exceptions or errors. In my migration experiment using the above scripts, with self-generated test data, I found the following results, including database size and the time taken to complete the migration. The following screenshot shows the performance results by write capacity. Note that the performance result is flexible and can vary depending on the server capacity, network bandwidth, degree of parallelism, conversion logic, program language, and other conditions. All provisioned write capacity units are consumed by the MapReduce job for data import, so the more you increase the size of the EMR cluster and write capacity units of DynamoDB table, the less time it takes to complete. Java-based MapReduce code would be more flexible for function and MapReduce framework. In the Lambda console, choose Create a Lambda function and the kinesis-process-record-python blueprint. Next, in the Configure triggers page, select the stream that you just created. The Lambda function must have an IAM role with permissions to read from Amazon Kinesis and put items into DynamoDB. The Lambda function can recognize the transaction type of the record by looking up the type attribute. The transaction type determines the method for conversion and update. For example, when a JSON record is passed to the function, the function looks up the type attribute. It also checks whether an existing item in the DynamoDB table has the same key with the incoming record. If so, the existing item must be retrieved and saved in a dictionary variable (item, in this case). Apply a new update information command to the item dictionary before it is put back into DynamoDB table. This prevents the existing item from being overwritten by the incoming record. Application codes need to be refactored when you change from MySQL to DynamoDB. The following simple Java code snippets focus on the connection and query part because it is difficult to cover all cases for all applications. For more information, see Programming with DynamoDB and the AWS SDKs. The following sample code shows a common way to connect to MySQL and retrieve data. Execute the query method with the querySpec instance previously created. Items are retrieved as JSON format, so use the getJSON method to look up a specific attribute in an item. 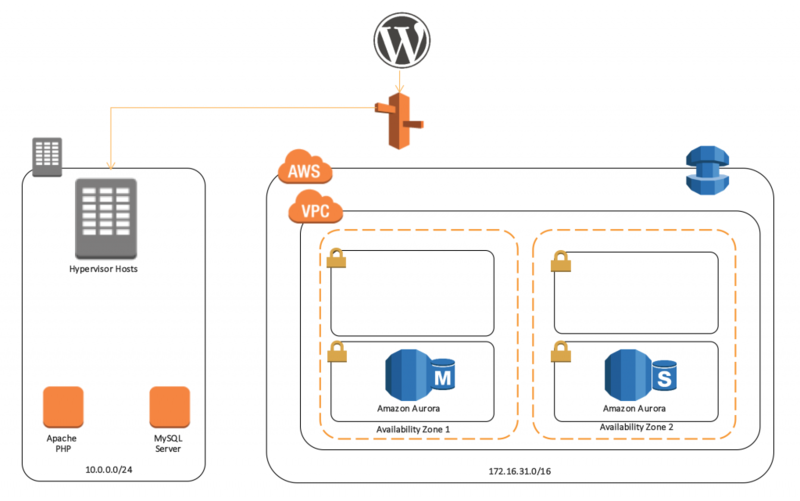 In this post, I introduced two options for seamlessly migrating data from MySQL to DynamoDB and minimizing downtime during the migration. Option #1 used DMS, and option #2 combined EMR, Amazon Kinesis, and Lambda. I also showed you how to convert the key design in accordance with database characteristics to improve read/write performance and reduce costs. Each option has advantages and disadvantages, so the best option depends on your business requirements. The sample code in this post is not enough for a complete, efficient, and reliable data migration code base to be reused across many different environments. Use it to get started, but design for other variables in your actual migration. I hope this post helps you plan and implement your migration and minimizes service outages. If you have questions or suggestions, please leave a comment below. I first wrote about AWS Database Migration Service just about a year ago in my AWS Database Migration Service post. At that time I noted that over 1,000 AWS customers had already made use of the service as part of their move to AWS. As a quick recap, AWS Database Migration Service and Schema Conversion Tool (SCT) help our customers migrate their relational data from expensive, proprietary databases and data warehouses (either on premises on in the cloud, but with restrictive licensing terms either way) to more cost-effective cloud-based databases and data warehouses such as Amazon Aurora, Amazon Redshift, MySQL, MariaDB, and PostgreSQL, with minimal downtime along the way. Our customers tell us that they love the flexibility and the cost-effective nature of these moves. For example, moving to Amazon Aurora gives them access to a database that is MySQL and PostgreSQL compatible, at 1/10th the cost of a commercial database. Take a peek at our AWS Database Migration Services Customer Testimonials to see how Expedia, Thomas Publishing, Pega, and Veoci have made use of the service. I’m pleased to be able to announce that our customers have already used AWS Database Migration Service to migrate 20,000 unique databases to AWS and that the pace continues to accelerate (we reached 10,000 migrations in September of 2016). March 2016 – General availability in eight AWS regions. May 2016 – Addition of Redshift as a migration target. July 2016 – Highly available architecture for ongoing replication. July 2016 – SSL-enabled endpoints & support for Sybase as a migration source and target. August 2016 – Expansion to Asia Pacific (Mumbai), Asia Pacific (Seoul), and South America (São Paulo) Regions. October 2016 – Expansion to US East (Ohio) Region. December 2016 – Support for Oracle SSL connections. December 2016 – Expansion to Canada (Central) and EU (London) Regions. January 2017 – Support for events and event subscriptions. February 2017 – Migration from Oracle and Teradata data warehouses to Amazon Redshift. Migrating From Sharded to Scale-Up – Some of our customers implemented a scale-out strategy in order to deal with their relational workload, sharding their database across multiple independent pieces, each running on a separate host. As part of their migration, these customers often consolidate two or more shards onto a single Aurora instance, reducing complexity, increasing reliability, and saving money along the way. If you’d like to do this, check out the blog post, webinar recording, and presentation. Migrating From Oracle or SQL Server to Aurora – Other customers migrate from commercial databases such as Oracle or SQL Server to Aurora. If you would like to do this, check out this presentation and the accompanying webinar recording. There’s also a hands-on lab (you will need to register in order to participate). The DMS team is planning to attend and present at many of our upcoming AWS Summits and would welcome the opportunity to discuss your database migration requirements in person. Another month of big data solutions on the Big Data Blog! Take a look at our summaries below and learn, comment, and share. Thank you for reading! Ever wondered what it takes to keep a user from leaving your game or application after all the hard work you put in? Wouldn’t it be great to get a chance to interact with the users before they’re about to leave? In this post, learn how ironSource worked with gaming studio Upopa to build an efficient, cheap, and accurate way to battle churn and make data-driven decisions using ironSource Atom’s data pipeline and Amazon ML. Healthcare providers record patient information across different software platforms. Each of these platforms can have varying implementations of complex healthcare data standards. Also, each system needs to communicate with a central repository called a health information exchange (HIE) to build a central, complete clinical record for each patient. In this post, learn how to consume different data types as messages, transform the information within the messages, and then use AWS services to take action depending on the message type. Amazon and Matroid will hold the first workshop on Data Management for End-to-End Machine Learning (DEEM) on May 14th, 2017 in conjunction with the premier systems conference SIGMOD/PODS 2017 in Raleigh, North Carolina. DEEM brings together researchers and practitioners at the intersection of applied machine learning, data management, and systems research to discuss data management issues in ML application scenarios. The workshop is soliciting research papers that describe preliminary and ongoing research results. In this post, learn to use AWS Database Migration Service (AWS DMS) and other AWS services to easily converge multiple heterogonous data sources to Amazon Redshift. 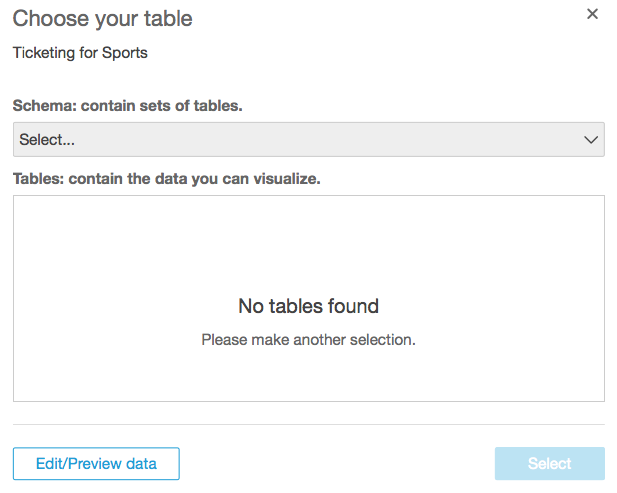 You can then use Amazon QuickSight, to visualize the converged dataset to gain additional business insights. It’s common for mixed workloads to have some processes that require higher priority than others. Sometimes, this means a certain job must complete within a given SLA. Other times, this means you only want to prevent a non-critical reporting workload from consuming too many cluster resources at any one time. Without workload management (WLM), each query is prioritized equally, which can cause a person, team, or workload to consume excessive cluster resources for a process which isn’t as valuable as other more business-critical jobs. This post provides guidelines on common WLM patterns and shows how you can use WLM query insights to optimize configuration in production workloads. In this post, learn how to set up encryption of data at multiple levels using security configurations with EMR. You’ll walk through the step-by-step process to achieve all the encryption prerequisites, such as building the KMS keys, building SSL certificates, and launching the EMR cluster with a strong security configuration. In this post, learn to generate a predictive model for flight delays that can be used to help pick the flight least likely to add to your travel stress. To accomplish this, you’ll use Apache Spark running on Amazon EMR for extracting, transforming, and loading (ETL) the data, Amazon Redshift for analysis, and Amazon Machine Learning for creating predictive models. Leave a comment below to let us know what big data topics you’d like to see next on the AWS Big Data Blog. Organizations often grow organically—and so does their data in individual silos. Such systems are often powered by traditional RDBMS systems and they grow orthogonally in size and features. To gain intelligence across heterogeneous data sources, you have to join the data sets. However, this imposes new challenges, as joining data over dblinks or into a single view is extremely cumbersome and an operational nightmare. This post walks through using AWS Database Migration Service (AWS DMS) and other AWS services to make it easy to converge multiple heterogonous data sources to Amazon Redshift. 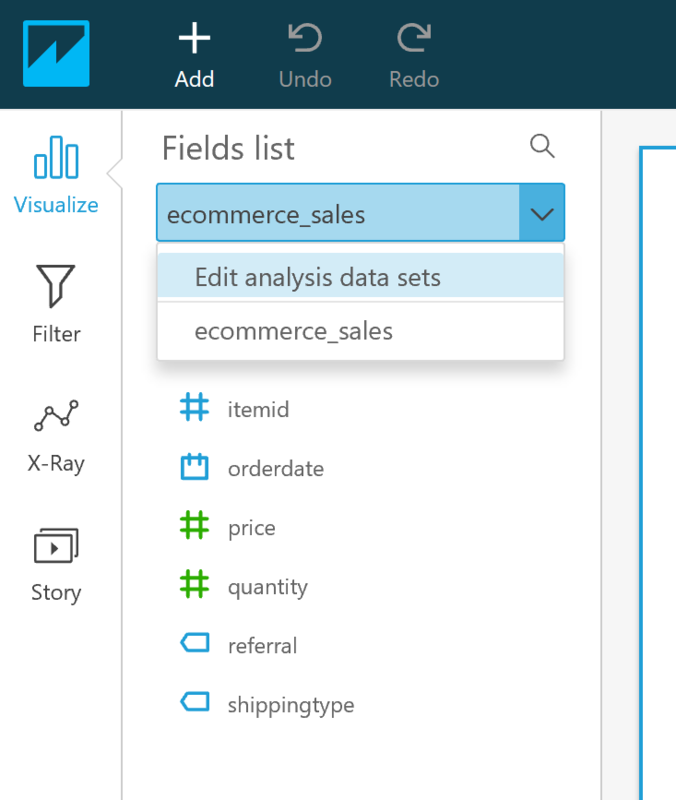 You can then use Amazon QuickSight, to visualize the converged dataset to gain additional business insights. 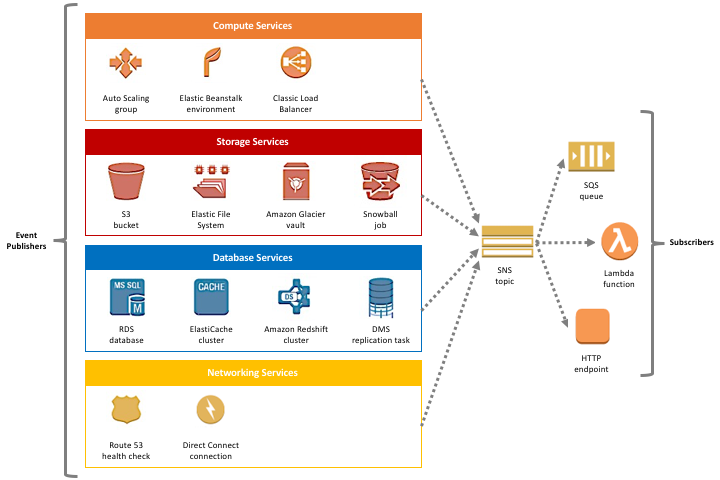 Here’s a brief overview of AWS services that help with data convergence. DMS enables consolidation and easy analysis of data in the petabyte-scale data warehouse. It can also be used for continuous data replication with high availability. 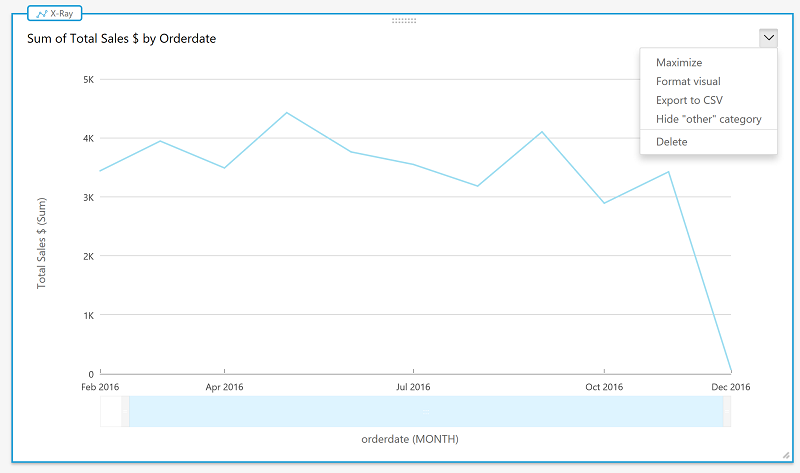 Amazon QuickSight provides very fast, easy-to-use, cloud-powered business intelligence at 1/10th the cost of traditional BI solutions. QuickSight uses a new, super-fast, parallel, in-memory calculation engine (“SPICE”) to perform advanced calculations and render visualizations rapidly. QuickSight integrates automatically with AWS data services, enables organizations to scale to hundreds of thousands of users, and delivers fast and responsive query performance to them. 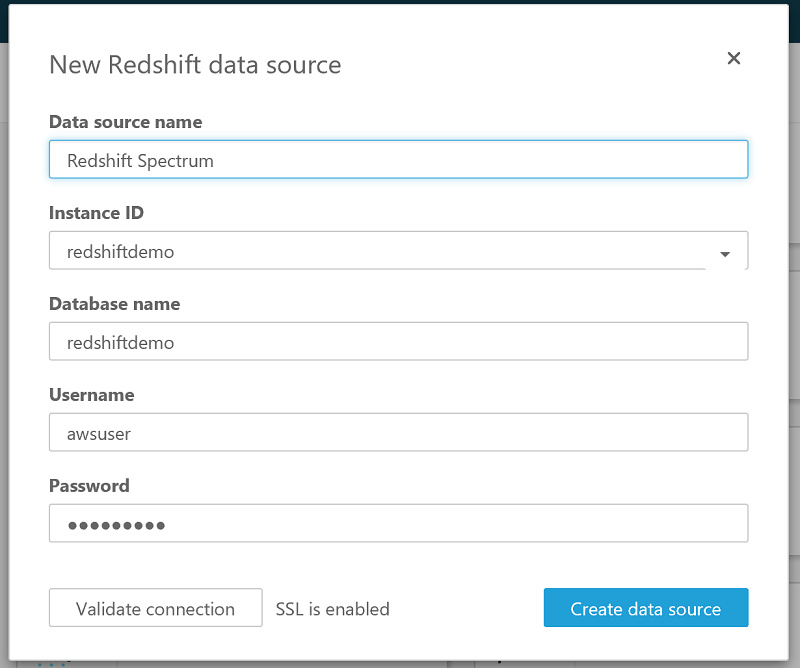 You can easily connect QuickSight to AWS data services, including Amazon Redshift, Amazon RDS, Amazon Aurora, Amazon S3, and Amazon Athena. You can also upload CSV, TSV, and spreadsheet files or connect to third-party data sources such as Salesforce. Amazon Redshift delivers fast query performance by using columnar storage technology to improve I/O efficiency and parallelizing queries across multiple nodes. Amazon Redshift is typically priced at 1/10th of the price of the competition. 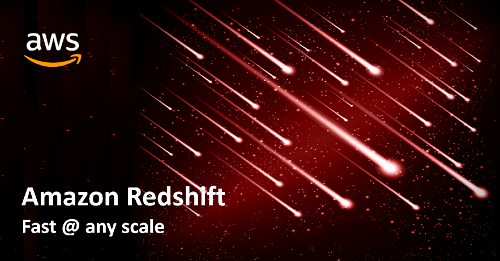 We have many customers running petabyte scale data analytics on AWS using Amazon Redshift. 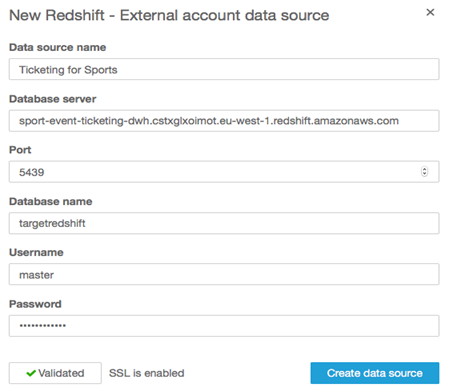 Amazon Redshift is also ANSI SQL compliant, supports JDBC/ODBC, and is easy to connect to your existing business intelligence (BI) solution. 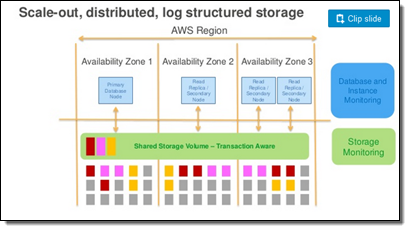 However, if your storage requirement is in the 10s of TB range and requires high levels of concurrency across small queries, you may want to consider Amazon Aurora as the target converged database. Assume that you have an events company specializing on sports, and have built a MySQL database that holds data for the players and the sporting events. Customers and ticket information is stored in another database; in this case, assume it is PostgresSQL and this gets updated when customer purchases tickets from our website and mobile apps. You can download a sample dataset from the aws-database-migration-samples GitHub repo. These databases could be anywhere: at an on-premises facility; on AWS in Amazon EC2 or Amazon RDS, or other cloud provider; or in a mixture of such locations. To complicate things a little more, you can assume that the lost opportunities (where a customer didn’t complete buying the ticket even though it was added to the shopping cart) are streamed via clickstream through Amazon Kinesis and then stored on Amazon S3. We then use AWS Data Pipeline to orchestrate a process to cleanse that data using Amazon EMR and make it ready for loading to Amazon Redshift. The clickstream integration is not covered in this post but was demonstrated in the recent Real-time Clickstream Anomaly Detection with Amazon Kinesis Analytics post. In this solution, you use DMS to bring the two data sources into Amazon Redshift and run analytics to gain business insights. The following diagram demonstrates the proposed solution. After the data is available on Amazon Redshift, you could easily build BI dashboards and generate intelligent reports to gain insights using Amazon QuickSight. You could also take this a step further and build a model using Amazon Machine Learning. Amazon Machine Learning uses powerful algorithms to create ML models by finding patterns in your existing data stored in Amazon S3, or Amazon Redshift. It is also highly scalable and can generate billions of predictions daily, and serve those predictions in real time and at high throughput. For the purposes of this post, create two RDS databases, one with a MySQL engine, and the other with PostgreSQL and then load some data. These represent a real-life scenario where databases could be located on-premises, on AWS, or both. Just as in real life, there may be more than two source databases; the process described in this post would still be reasonably similar. Make a note of the security group that you create and associate all the RDS instances with it. Call it “MyRDSSecurityGroup”. Afterward, you should be able to see all the databases listed in the RDS Instances dashboard. 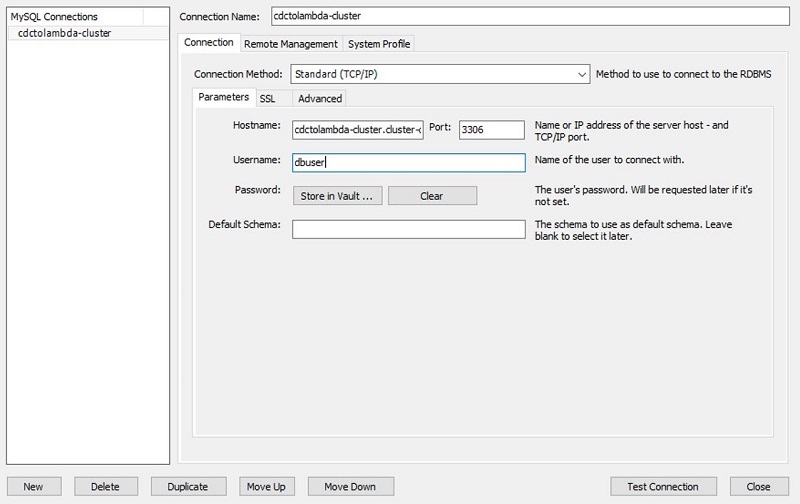 Set up a two-node cluster as shown below, with a cluster name similar to “consolidated-dwh” and a database named similar to “mydwh”. You could also set up a one-node cluster based on the instance type; the instance type may be available on the AWS Free Tier. In the next step, choose Publicly Accessible for non-production usage to keep the configuration simple. 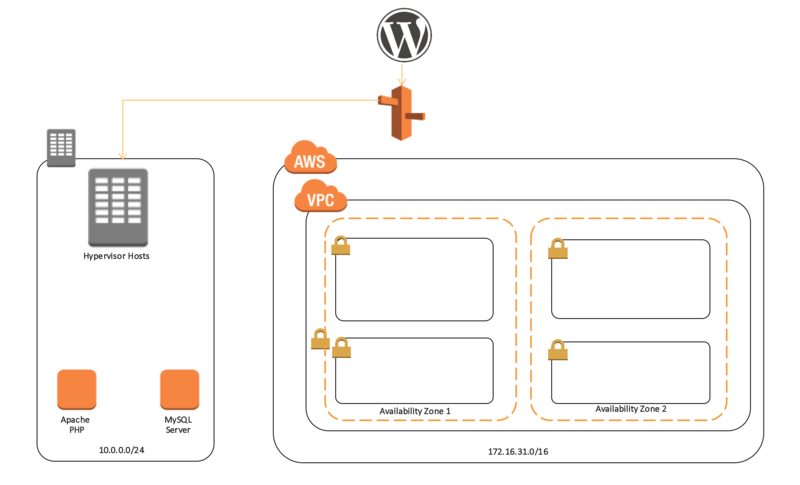 Also, for simplicity, choose the same VPC where you have placed the RDS instances and include the MyRDSSecurityGroup in the list of security groups allowed to access the Amazon Redshift cluster. 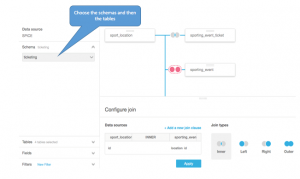 Create the endpoints for the two source databases and the target Amazon Redshift database. Create a task to synchronize each of the sources to the target. In the DMS console, choose Replication instances, Create replication instance. The instance type you select depends on the data volume you deal with. After setup, you should be able to see your replication instance. You can rely on DMS to create the target tables in your target Amazon Redshift database or you may want to take advantage of AWS Schema Conversion Tool to create the target schema and also do a compatibility analysis in the process. 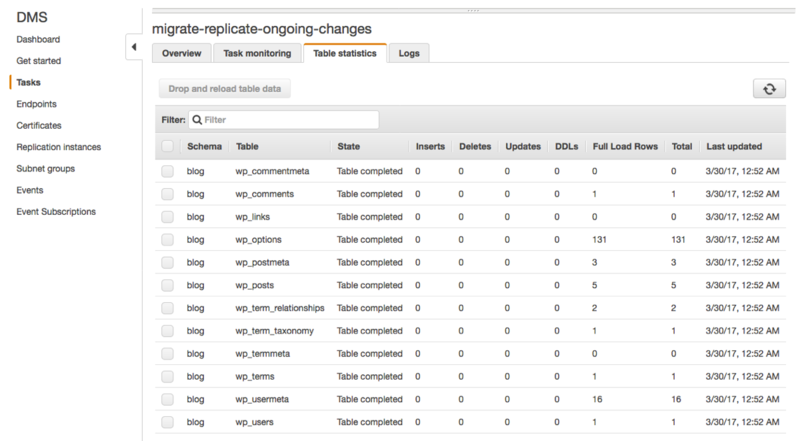 Using the AWS Schema Conversion Tool is particularly useful when migrating using heterogeneous data sources. For more information, see Getting Started with the AWS Schema Conversion Tool. For simplicity, I avoided using the AWS Schema Conversion Tool in this post and used jump to DMS to create the target schema and underlying tables and then set up the synchronization between the data sources and the target. Now, choose Start task on create. In the task settings, choose Drop tables on target to have DMS create the tables, if you haven’t already created the target tables using the AWS Schema Conversion Tool, as described earlier. Choose Enable logging but note that this incurs additional costs as the generated CloudWatch logs require storage. In the table mappings, for Schema to migrate, ensure that the correct schema has been selected from the source databases. DMS creates the schema on the target if it does not already exist. Using this custom configuration, you can perform some minor transformations, such as down casing target table names, or choosing a different target schema for both sources. 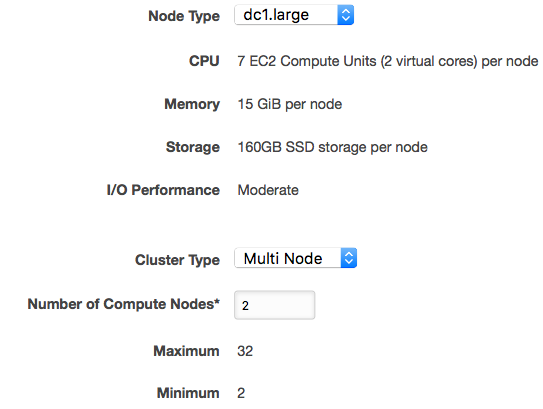 In Amazon Redshift, select your target cluster and choose Loads. You can see all operations that DMS performed in the background to load the data from the two source databases into Amazon Redshift. Generate additional data on Amazon RDS PostgreSQL in the ticketing.sporting_event_ticket by running the script provided in the generate_mlb_season.sql aws-database-migration-samples GitHub repository. Notice that the tasks have caught up and are showing the migration in progress. 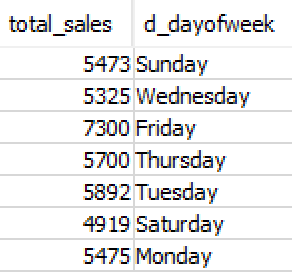 You can also query the target tables and see that the new data is in the target table. 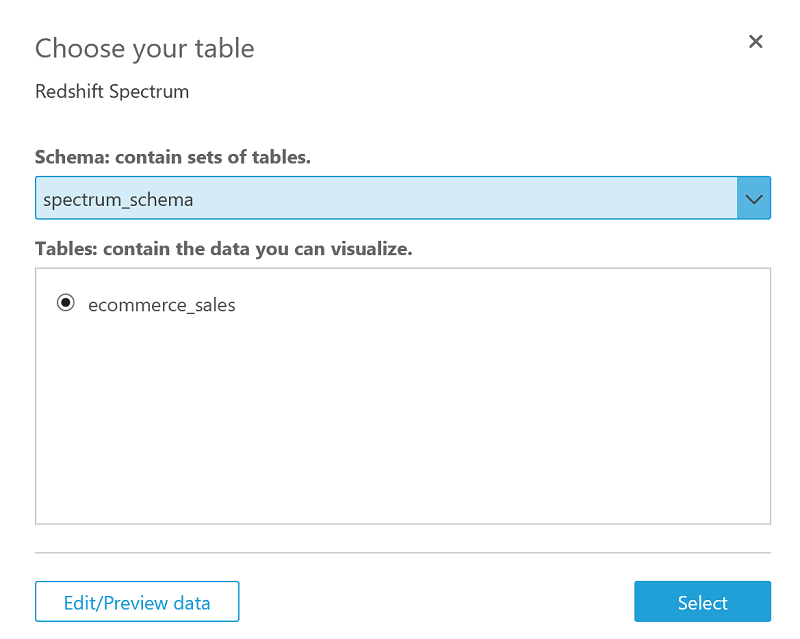 Set up QuickSight and configure your data source to be your Amazon Redshift database. 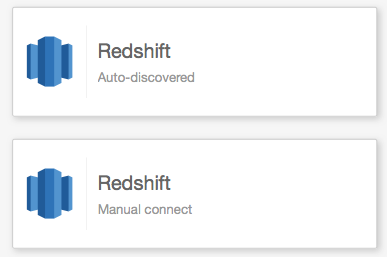 If you have a Redshift cluster in the same account and in the same region, it will appear when you clock Redshift (Auto-discovered) from the data sets page, as shown below. Now, create your data set. Choose New Data Set and select either a new data source or an existing data source listed at the bottom of the page. Choose Ticketing for Sports. In the next step, choose Create Data Set. In the next step, when QuickSight prompts you to choose your table, you can select the schema and the required table and choose Select. Alternatively, you may choose Edit/Preview data. You could use the graphical options shown below to start creating your data set. Given that you have data from multiple sources, it’s safe to assume that your target tables are in separate schemas. Select the schema and tables, select the other schemas, and bring the appropriate tables to the palette by selecting them using the check box to the right. For each join, select the join type and then map the appropriate keys between the tables until the two reds turn to one of the blue join types. In this case, rather than preparing the data set in the palette, you provide a custom SQL query. On the left pane, choose Tables, Switch to Custom SQL tool. 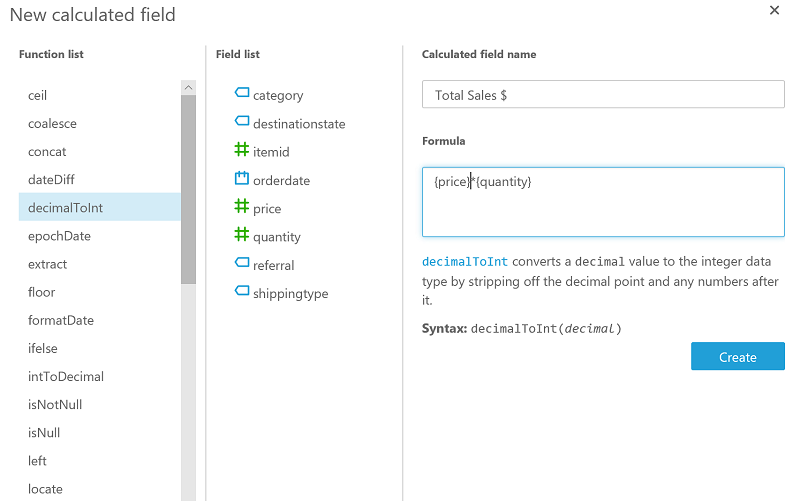 Paste the following SQL query in the Custom SQL field and enter a name. You can choose Save and visualize and view the QuickSight visualization toolkit and filter options. Here you can build your story or dashboards and start sharing them with your team. Now, you can choose various fields from the field list and the various measures to get the appropriate visualization, like the one shown below. This one was aimed to understand the date at which each event in each city reached the maximum capacity. 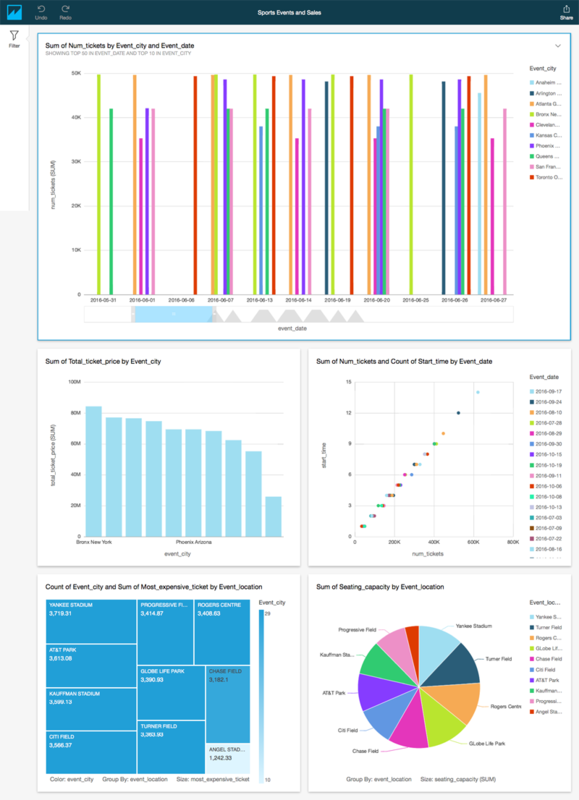 You can also combine many such visualizations and prepare your dashboard for management reporting. The analysis may also drive where you need to invent on campaigns and where things are going better than expected to ensure a healthy sales pipeline. 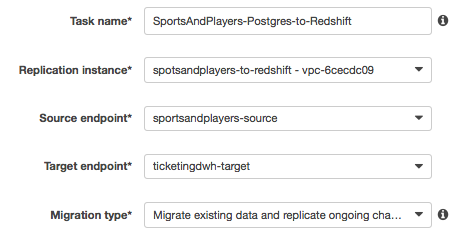 In this post, you used AWS DMS to converge multiple heterogonous data sources to an Amazon Redshift cluster. You also used Quicksight to create a data visualization on the converged dataset to provide you with additional insights. Although we have used an e-commerce use case related to an events company, this concept of converging multiple data silos to a target is also applicable to other verticals such as retail, health-care, finance, insurance and banking, gaming, and so on. Pratim Das is a Specialist Solutions Architect for Analytics in EME. He works with customers on big data and analytical projects, helping them build solutions on AWS, using AWS services and (or) other open source or commercial solution from the big data echo system. In his spare time he enjoys cooking and creating exciting new recipes always with that spicy kick.